Virgin Galactic publicly unveils the SpaceShipTwo VSS Enterprise, its first suporbital spaceliner, attached to the WhiteKnightTwo Eve carrier craft on Dec. 7, 2009 in Mojave, Calif.
Talk about a party-crasher: Just hoursafter British billionaire Sir Richard Branson unveiled a gleaming new commercialspaceship in the California desert this week, hurricane-force winds leveled thegala event?s tents. But luckily no one ? or spaceship ? was harmed. A newvideo and photos released by Branson?s space tourism venture VirginGalactic recounts the harrowing Monday night after the company unveiled SpaceShipTwo,a new suborbital spaceliner slated to begin launching public trips to space in 2011.Dangerous winds forced the 800 revelers and reporters on hand for the spacecraft?sdebut to evacuate the Mojave Air and Space Port in Mojave, Calif.
Windsgusting at speeds of up to 116 mph (186 kph) pummeled the event site and rippedthe roof off the 200-foot (60-meter) main tent used during the SpaceShipTwogala. 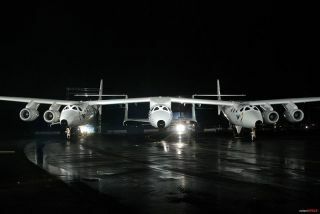 It was the first time in 20 years that such winds, rain and freezingtemperatures, Virgin Galactic officials said. ?It wasabsolutely incredible, the roll out of the spaceship had been fantastic andeverybody was filled with terrific energy,? Branson said. ?We were all in thetents when the evacuation was called. Twenty minutes after the last of the 800guests had been coached away, the main 200-foot tent literally took off.? Views ofthe aftermath revealed the twisted and gnarled remains of the tent, but all ofVirgin Galactic?s guests were safely evacuated. The SpaceShipTwoVSS Enterprise, a sleek spacecraft designed to fly eight people ? six passengersand two pilots ? to suborbital space and back made through the gale unscathed. Therocket ship was attached to its massive WhiteKnightTwo mothership, called Eve,throughout the stormy encounter. Virgin GalacticPresident Will Whitehorn said both vehicles were well away from the tent area whenit was destroyed. SpaceShipTwois a commercial spacecraft built for Virgin Galactic by the Mojave,Calif.-based company Scaled Composites founded by aerospace visionary BurtRutan. Rutan and his Scaled colleagues also built the craft?s predecessor ? thesingle-pilot SpaceShipOne ? which flew several spaceflights in 2004 and won the$10 million Ansari X Prize for privately financed, reusable suborbital vehiclesthat year. VirginGalactic plans to eventually expandits fleet up to five SpaceShipTwo vehicles and two WhiteKnightTwomotherships in order to offer trips to suborbital space 68 miles (110 km) aboveEarth. Ticket prices are going for $200,000 a ticket and many spacetourists-to-be were on hand Monday night to see the first SpaceShipTwo make itspublic debut. ?We werefully expecting to be blown away by our beautiful new spaceship but got alittle more than we bargained for!? Branson said. Public Space Travel: Reality or Mirage?